Although the collection of European paintings is not as rich as the Greek one, it nevertheless presents some special interest. Both the major and the lesser schools of European painting are represented in it; the number of examples is indicative of their respective importance in the different periods, and the quality of a good number of them is high. Its larger and more significant part comes from the old collections of the National Technical University and of the University of Athens; they were subsequently enriched with generous donations of Greeks of the diaspora and of others, such as Alexandros Soutzos, George Averof, Theodoros and Ecaterini Rodocanaki etc. The earliest exhibits are from the fourteenth century, while the latest ones are a few examples of contemporary art. Most of the paintings in the collection date from the mid-sixteenth to the mid-nineteenth century. Italy, France and the Low Countries are quite well represented among them. However, the Italian works of art occupy a prominent position both because of their number and their quality. Themes from the Old and the New Testament are frequently encountered here, while historical and mythological scenes are more limited in number. With some notable exceptions, still lifes, landscapes and genre scenes begin to have a significant presence in the repertory of the European painters in the course of the seven teenth century. Three paintings by Venetian artists should be mentioned in this connection, because they are notable examples dating from the earliest period: the "Holy Trinity" (l4th century), the "Crucifixion" by Lorenzo Veneziano (1357-1379) and the "Virgin with Child and Angels" by Zannino di Pietro (l5th century); to these Venitian works we should add "Saint Jerome" in the desert by the Florentine artist Jacopo del Sellaio (1441/2-1493). The interest of the Low Countries in genre painting is demonstrated by outstanding pictures such as Joachim Beuckelaer's (1530-1575) "Market Scene" and David Vinkenboons "Wine Harvest" (1576-1629). 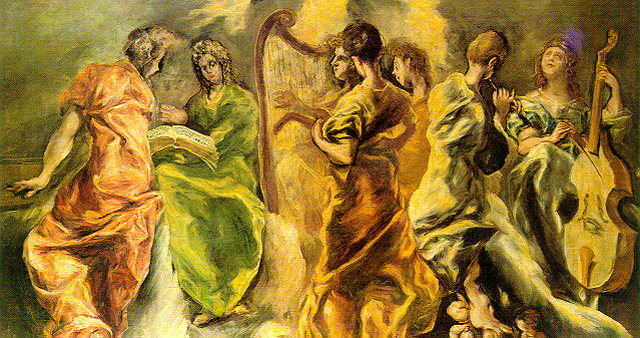 The "Concert of the Angels", a work by the leading artist Domenicos Theotocopoulos or El Greco (1541 -1614), a native of Crete is undoubtedly one of the treasures of the National Gallery. The gap created by the absence of a good number of famous names and of representative movements in European art from the collection of European painings may be filled by the large and important collection of European engravings. A few major examples are by leading artists from the Renaissance to the end of the l9th century; Duerer, Rembrandt, Claude Lorrain, Ribera, van Ostade, Canaletto, Piranesi and the more famous impressionists and post-impressionists are among them.